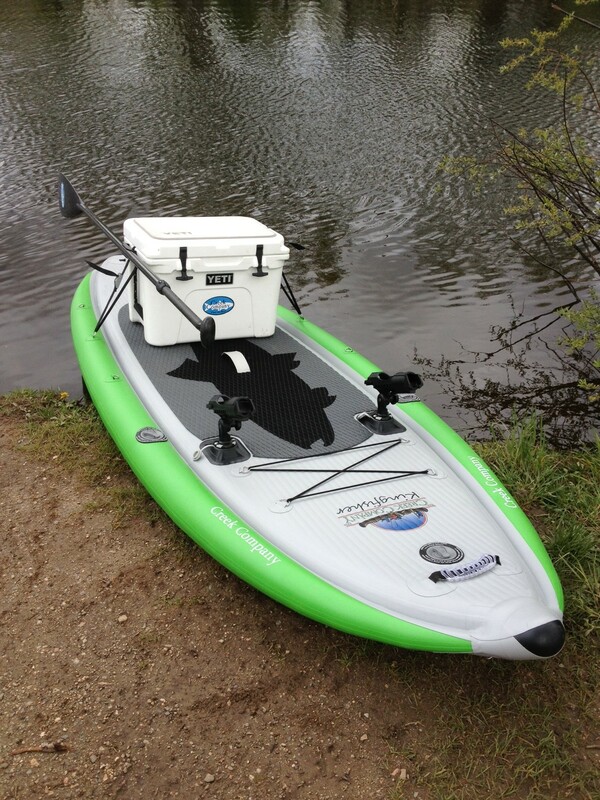 Kingfisher Inflatable Fishing SUP---The advanced design of the Kingfisher, which includes multiple chambers and integrated pontoon rails, creates a super stable, super rigid board that's only 31 lbs! At 10’ x 41" x 6", the extra wide Kingfisher provides all the stability you need to paddle rivers, lakes, flats and bays pursuing your favorite fish! The inflatable Kingfisher rolls up into its own backpack and goes with you anywhere! Plenty of D-rings and bungee for securing gear and a cooler. Be stealthy, cover more water, see more fish from an elevated line of sight and cast with full range of motion! The Kingfisher is inflatable and checks through on a plane or stows in your boat or car, so you can take it anywhere and fish any water, any time! Rod holders sold separately. - 10’ x 41” x 6"/4"(6" side rail pontoons/4" drop stitch deck) hull of double layers of .9mm PVC fitted with 3 high pressure, 15 psi valves allowing for a very rigid board. 3 separate chambers! - 6” pontoon rails integrated with 4” deck.